It has been mentioned in our previous article that learning about the elements that affect the growth rate of fish is one of the crucial factors that need to be considered before setting up aquaponics systems. You need to know the best ways to regulate the pH level, water temperature, dissolve oxygen levels and other elements that ensure the optimum health of your fish along with your hydroponic plants. Remember, choosing the right variety of fish and knowing what they need are extremely important in aquaponics gardening. Fortunately, it is not difficult to keep any fish happy and healthy. Choose a variety of fish that you are allowed to grow, and the ones which you are certain you can take good care of. Indeed, you need to be aware of the varieties of fish that are acceptable to be grown in your region. Although almost any types of fish are suitable in Aquaponics, there are certain species of fish which are not allowed to be grown at home or for commercial purposes. Research well to identify the best fish varieties, and whether you can actually cater to their specific needs. 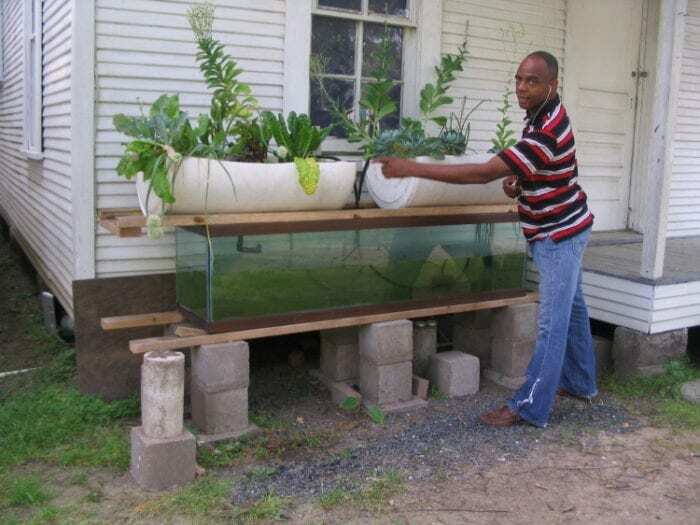 Determine the most convenient location and set up a simple yet durable aquaponics system. Use an appropriate tank; select the right pumps as well as valves, pipes, fittings, tubing, and other components necessary to building a system. Work out the best type of hydroponic system. You can opt for either a Media-based system or a Nutrient Flow system. Think about your resources and objectives. Be knowledgeable about the cycling of a fish tank. Cycling is a way to ensure a well-balanced and non-toxic aquatic environment. It’s the process by which you initiate the colonization of bacteria in your system. When the conversion of Ammonia to Nitrates is taking effect, the system is said to have ‘cycled.’ This usually occurs within two to four weeks upon the introduction of fish into the system. You can’t just fill a tank and throw some fish into it, and expect positive results without doing anything. Take into account the importance and roles of various bacteria in an aquaponic garden. You don’t have to dig deeper into the intricacies of the Nitrogen Cycle. Just see to it that nitrifying bacteria which are responsible in converting fish wastes into plant food are in sufficient numbers. Moreover, the Nitrite and Ammonia levels should be in constant check. Live fish cycling and Nitrogen dosing are the two known ways to cycle a system. Various tools and devices can help you measure and/or regulate Ammonia, Nitrites and Nitrates. Take note that this process could take some time. Hence, patience and consistency are of great importance. Do things slowly but surely. Always keep in mind that excess food will contaminate the water, and thus will cause imbalance to your system. Too much body fat will also develop due to overfeeding while slow growth is a consequence if your fish don’t get enough food. Therefore, you have to be vigilant with regards to the metabolism and appetite of your fish variety. You ought to feed them pelletized fish food that is specifically formulated for your chosen species or grow your own fish food such as animal protein. You need to guarantee good quality water and well-controlled temperature when you want your fish to grow quickly and healthy. You must understand the applicable parameters and ensure access to a toxic-free water source. You should be able to test and deal with the hardness of your water. In addition, the testing and regulation of pH level is one of the crucial procedures that you have to consistently carry out to maintain good water quality. A pH of 6.8 to 7.0 is most favorable to an aquaponics garden. Make use of the right test kits and learn the best ways to lower or raise pH level. Know about the acceptable rate of Ammonia, Nitrite and Nitrate in your system. Exposure to a certain concentration of Ammonia or Nitrite can result in death or permanent damage to the fish. Excessive Nitrate can also harm the fish over time. Test kits can help in measuring various forms of Ammonia. Maintain sufficient Dissolved Oxygen levels. Temperature and density of fish in the system are the main aspects that affect the level of DO. Thus, see to it that you keep watch of the water temperature and agitate the water surface of the fish tank based on the needs of your fish, plants and some bacteria. Be aware of water contamination, and always make an effort to avoid any sources or contaminants. Get rid of chemical-based fertilizers, pesticides and fungicides. Instead, go organic or make use of natural alternatives. Neutralize water containing Chlorine or Chloramine. Say no to copper and treated wood structures. Your system should not come in contact with any chemicals including detergents. You should also do something about the presence of algae. Basically, it’s the consequence of too much light and excessive nutrients in the fish tank. Try to adjust pH levels consistently, use mechanical filters, regulate feeding, cover your tank and limit the amount of light being emitted on your tank. You should be able to control the temperature in your tanks in order to ensure the optimum growth of your fish. Use supplementary heating when need be or depending on your location. Proper aeration is a must. Cover the tank to minimize erratic temperature during the night. Insulating the tank can also resist heat loss. You ought to choose the fish varieties that are suitable to the climate in your area. There are many different fish diseases, and a multitude of chemical concoctions being offered as a cure. Try not to use any chemical-based treatments as such are not only detrimental to your fish but also to your own health. Ich (Ichthyophthirius multifiliis) or the so-called ‘white spot’ is the most common parasitic disease that you’re likely to deal with in your system along with some common fungus. You can prevent Ich by putting all new fish in quarantine after purchasing from the nearest source that is clear of the disease. You should not mix new fish to your existing ones, especially with different ages. Avoid fluctuations in temperature level, pH level and Ammonia. Closely monitor new fish including the existing ones. Be aware of symptoms and treat the disease as soon as it appears. You may think that a lot of hard work must be carried out before you can reap the rewards and benefits of a well-functioning aquaponic system. It may seem complicated and arduous to engage in Aquaponics. However, all the time and effort that you invest in such project will eventually pay off; particularly if you really make an effort in keeping both your plants and fish happy and healthy. This is why you need to understand the aspects which are very essential to fish health along with the factors that could affect the production of your hydroponic plants before starting up any system. Research well and implement the most appropriate methods so that you can enjoy fresh fish and tasty organic crops.